Dedicated to the best in Dishes, Dining, Diversions, and Design. 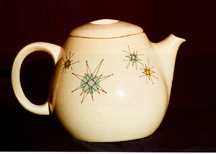 Starburst was manufactured from 1954-1957 by Franciscan Pottery -- Gladding, McBean & Company. There were fifty different shapes available. Many pieces were common, and can be found today in antique and second-hand stores all over the United States. The serving pieces and specialty pieces were not produced in quantity, and are today difficult to find in good condition. Unlike most of today's decal dinnerware, Starburst was high-quality, including a fully glazed bottom. The bottom of each piece has one of two marks. Kerry and I started our collection in March 1996. One day when walking through a small antique shop in Southern California we saw a tea cup and knew that we had to have it. Now we are hooked. Every time we are out of town we stop in the antique stores to see if they have anything we need. Most of our collection has come from one dealer in Southern California--who has very good prices and can find what we need. I would tell you who he is... but our collection is not yet complete. Quanto credis hoc illius tibi staturam? If you would like to write use your google and find my reply to address. Please note: Due to the volume of mail -- I'm not able to respond to each request for information. I work at Grace to You, a non-profit Christian Ministry. The Fickett Family parks its pages here at the Starburst Foundation.